What’s the performance of the textile industry in the first three quarters? Since 2018, the world economy stays on the road to recovery, the market demand is relatively exuberant, and the international and domestic market of textile and garment achieve rapid growth, ensuring the stable operation of textile industry. With the continuously promoting of supply-side reform of textile industry, supply-demand relationship has improved, sales format continues to innovate, the development quality improves steadily, and the main indicators shows a monthly recovery tendency. Looking forward to the whole year, it is expected that the textile industry remains stable operation driven by domestic consumption and under the support of transformation. However, it still needs to overcome a series of external pressures, such as cost and environmental protection, etc. ; besides, the trade frictions should be properly disposed, the high-quality development of the industry accelerates, and the anti-risk capability desperately needs to be elevated. The old and new formats of domestic market speed up simultaneously. According to the statistics of State Statistics Bureau, per capita disposable income has been increased by 6.6% in real terms in the first three quarters of 2018; the consumption expenditures has been increased by 6.3% actually; both of them are faster than the growth level of 6.2% in GDP per capita. Besides, consumption contribution rate increases to 78%, the daily consumer goods that are closely related to people’s livelihood is the main driving force for domestic demand growth. The traditional sales of textile and clothing production are better than the previous year. From January to September, the retail sales volume of clothing and shoes, knitwear and textiles above the national limit has been increased by 8.9% on year-on-year basis, while the growth is 1.7 percentage points higher than a year earlier, which is at a high level of growth over the past three years. In addition, emerging business forms have maintained rapid growth, the retail sales volume of national online clothing category goods has been increased by 23.3% on year-on-year basis, and the growth rate is 4.1 percentage points higher than that of the same period last year. Export market continued to revive. 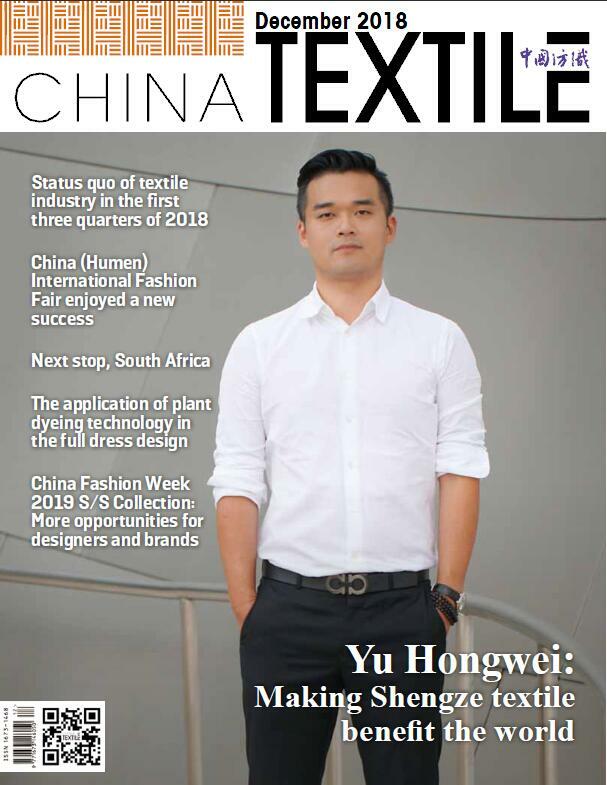 According to customs express data, the gross export (excluding Chapter 94) of China’s textile clothing from January to September is US $207.77 billion, with a year-on-year growth of 4.6%; the growth is 3.7 percentage points higher than that of a year earlier and 1.3 percentage points faster than that of the first half of this year. From the perspective of product structure, textiles have stable competition, the amount of exports has increased by 10.5% on year-on-year basis; the growth is 7.6 percentage points higher than that of a year earlier, the proportion accounting for gross export has increased to 43%. Due to the influence of rising manufacturing costs, purchase orders, investment transfer and other factors, clothing industry faces with huge export pressure, and the amount of exports from January to September only rises 0.6%. From the perspective of different country, the amount of exports of Textile materials and textile clothing in USA, EU and Japan rises 8.5%, 3.4% and 4.8% respectively on year-on-year basis, the export growth to USA has increased by 9.1 percentage points on year-on-year basis. Meanwhile, the amount of exports in Vietnam, Turkey, Indonesia and other markets along the Belt and Road rises 30%, 5.7% and 21.6% respectively on year-on-year basis, which has sound growth trend. Economic benefits make continuous improvement in quarter-on-quarter terms. From January to September, 36,000 textile enterprises above state designated scale have achieved main business income of 4219.76 billion Yuan, with a year-on-year growth of 4.2%. The growth slows 3.5 percentage points from a year earlier but rises 0.1 percentage points compared with that of the first half of this year; the total profit has reached to 198.08 billion Yuan, with a year-on-year growth of 7.1%; the growth slows 3.5 percentage points from a year earlier but rises 4.7 percentage points compared with that of the first half of this year. From the perspective of industrial chain structure, chemical fiber industry has stable high benefits on account of increasing industrial concentration, extension of large-scale enterprise to upstream refining process and other reasons. From January to September, main business income and total profit increase 14.4% and 22.3% respectively on year-on-year basis, driving the growth rate of main business income and profit of the whole textile industry by 2 and 3.2 percentage points respectively. The operation quality is relatively stable. From January to September, the profit ratio of sales of textile enterprises above state designated scale is 4.7%, which increases 0.1 percentage points higher than that of the same period last year. Furthermore, total assets turnover is 1.3 times/year, the ration of three fees is 6.9%, which is same as that of the same period of last year. Capacity utilization maintains a high level, while production growth has slowed. From January to September, the rates of capacity utilization of textile industry and chemical fiber industry have reached to 80.6% and 82% respectively, which are higher than the national average level of 76.6%. In the corresponding period, the industrial added value of textile enterprises above the national scale has increased by 2.9% on year-on-year basis, which is slower 2 percentage points than that of the same period of last year and faster 0.1 percentage points than that of the first half year. The production growth of industrial chain terminal is relatively stable, and the industrial added values of garment, home textile and industrial textile industries rise 4.6%, 4.9% and 8.4% respectively on year-on-year basis. Capital and technology intensive industries have faster production growth, the industrial added value of chemical fiber industry increases 8.2% on year-on-year basis, which is faster 2.8 percentage points than that of the same period of last year. In addition, the industrial added value of textile machinery industry increases 12.5% on year-on-year basis, reflecting that the domestic equipment market competitiveness has been steadily improved. Investment growth picks up month by month. According to data of State Statistics Bureau, it can be calculated that the fulfilled amount of fixed-asset investment for the whole textile industry rises 5.8% on year-on-year basis from January to September, which is down 0.4 percentage points from the same period of last year. However, it rises 9.1 and 4.5 percentage points from the first quarter of this year and the first half year respectively. From the view of different industry, the growth of textile industry (including spinning, weaving, dyeing and finishing, knitting, home textiles and industrial use) rises 5.1 percentage points from the first half year, which reaches to 5.9%. Besides, the chemical fiber industry grows 31.9% on year-on-year basis, which maintains rapid growth for six consecutive months; however, the investment in clothing industry decreases 1.6% on year-on-year basis. Looking forward to the future, the world economy continues to revive, while U.S. interest rate rise results in liquidity contraction and trade protectionism has intensified in the United States, which exert negative effects on global economic growth. According to the latest report released by IMF in October, the predicted value of global economic growth in 2019 has been decreased to 3.7% from 3.9%, the growth of international market demand tends to slow down. Under the influence of external circumstance change, China’s macro economy will face with larger pressure, while the general trend of steady development will not fundamentally change. The state strengthens stable employment, people’s income and consumption level strides forward to the overall well-off level, therefore, the domestic market of textiles and apparel will grow sustainably, which will become absolute main force to drive the development of textile industry. With the continuously upgrading of Sino-U.S. trade friction, although tax increases in the United States has few direct negative effects on textile industry, uncertainty about the trading environment has risen, thus the international purchasers and domestic manufacturers increase their concern. Moreover, Factors that will affect the running of the industry in the long run, including rising factor costs, increasing pressure on environmental protection and difficult and expensive financing will still exist, textile enterprises still need to strengthen countermeasures. Throughout the current year, the whole textile industry continue to run smoothly and stably, the main operating index basically maintains the current growth level. In the next year, the domestic and foreign market environment faced by China’s textile industry will change steadily, textile industry will run more difficultly. Furthermore, the export situation will become more uncertain, the internal demand of the industry to drive high-quality development will be more urgent, hence, it should be attached greater importance to improve production efficiency and anti-risk capability, to continue to maintain steady development.